After waiting for the highly-anticipated PappaRoti Montreal to open its doors, patrons were excited to get their hands on some coffee buns when it finally opened at the beginning of May, 2017. Known for its freshly-baked South East Asian roti buns, AKA “the father of all buns” made from a family recipe, this particular location of the eatery offers way more than just sweet treats. 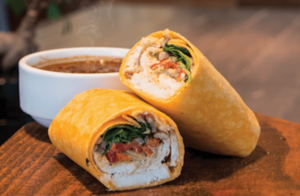 Customers can expect lunch items like salads, sandwiches, and soups too, including combo deals like a soup and sandwich for $9.99, and an original bun and sandwich for $9. This location of PappaRoti also has cold pressed juices and gluten free pastries which customers can enjoy in the beautiful two-level cozy cafe with free Wi-Fi. The chain had humble beginnings opening a single store in Malaysia in 2003. Today, PappaRoti has over 400 stores and kiosks worldwide in Asia, Australia, England, North America, and the Middle East.